Over 7,000 trees make up this beautiful new woodland planted at Scar House Reservoir on High Woodale Farm, Upper Nidderdale. Set in the stunning Nidderdale landscape Woodale wood is an important habitat for native wildlife, including endangered species such as common redstart, cuckoo, and black grouse. The new woodland will also grow to support ancient woodland flora, invertebrates, and other wildlife. Tree planting on the site links and expands existing woodland, with care taken to support biodiversity. Several other endangered species of bird will also benefit from the woodland including: song thrush, mistle thrush, fieldfare, redwing, ring ouzel and spotted flycatcher - which are all UK Biodiversity Action Plan species. 7,000 trees are planted here including native species such as birch, oak, hawthorn, rowan, bird cherry, holly, some gorse and Scots pine. 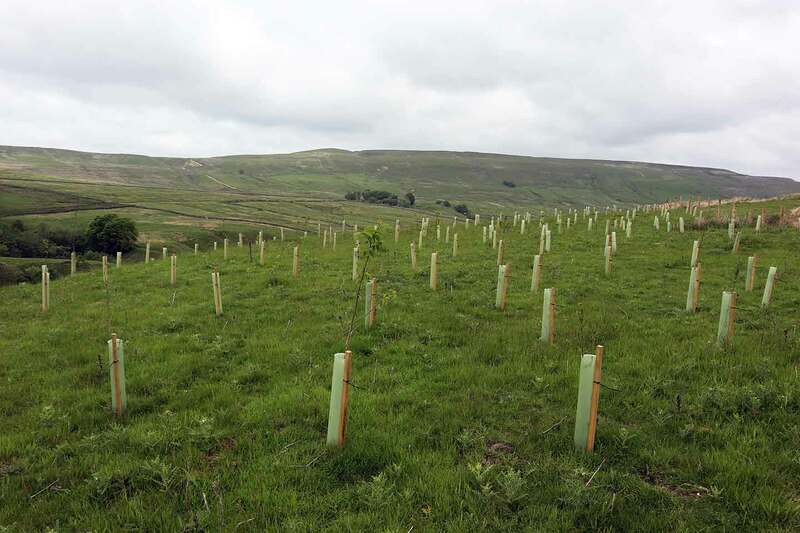 The woodland is planted at High Woodale Farm in Upper Nidderdale, in partnership with landowner Yorkshire Water.